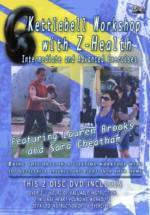 This is the only DVD made for pregnant women with the option of using a kettlebell during the workout. I said above that Brooks emphasizes proper form throughout the video. She does so in a particularly effective way – she’s pregnant! Brooks was a bit over six months pregnant when she filmed the DVD, and she looks amazing! I don’t know about you, but when I’m pregnant it definitely helps to see other big-bellied mama’s getting their kettlebell swing on. And Brooks does just that. She may not be as peppy and smiley as other prenatal fitness instructors. She may not have the flashy sets and skinny backup models that you find in other “sleek” DVDs (which I always found a bit annoying when my waistline was growing by the minute). But Brooks does have a few things that others don’t: the ability to inspire with a cute baby bump and a killer kettlebell swing. For these reasons, I would recommend her DVD for all pregnant women, as well as those in the postpartum period. I’ve used Lauren Brooks’ Baby Bells workout for the past month and love it! I had started using kettlebells last summer and was worried that I would have to abandon them for some ho-hum workout once I got pregnant. Luckily, I stumbled on this DVD on Amazon while looking for a workout and I’m very happy. It’s challenging without being overkill, and Lauren was 6 1/2 months pregnant while shooting the DVD, so it was nice to see that it could be done. The DVD is broken down into warmup, workout, and cool-down. The workout section has three “rounds” of exercises (3-5 exercises per round that are repeated twice). Not all of the exercises involve a kettlebell/weight (e.g., side planks, pushups), and she gives the option of using dumbbells for people who may not have used kettlebells. Lauren also shows modifications for each of the exercises so that women who’ve never used kettlebells or prefer to not use weights at all can do them. I am six months pregnant, and wanted a dvd basically to keep strong during my pregnancy, and bought this one and Perfect Pregnancy Workout by Karyne Steben, which both fit the bill perfectly and were exactly what I was after. I’m a pretty fit and active person, some would say very fit and active;), and in my other pregnancies I was afraid to do too much so basically just walked through my pregnancies. I was in my early twenties when I had my first two children, so it wasn’t so much of a problem bouncing back. But with my third pregnancy a couple of years ago I found it harder losing the weight and getting fit and strong again after my pregnancy, and now at 40 expecting my fourth baby, I wanted to keep up some sort of strengthening programme during my pregnancy aside from walking and swimming, but which felt safe as well. I am relatively new to kettlebells. I had just started trying them out a couple of months before my pregnancy, so wasn’t sure if it was something I should continue through my pregnancy, so am rapt to have this dvd, and know that I am doing a safe workout with the kettlebells. Lauren is a great instructor, and easy to follow, and I like that there is no unnecessary chatter, and just good direct instructions along the way. I also bought her dvd The Ultimate Body Sculpt and Conditioning with Kettlebells Vol 1, and look forward to trying that out when I start into a programme after baby is born. Thoroughly recommend this for other pregnant ladies, if you are relatively fit and strong to begin with (not for beginners). I am passing this dvd onto my mum when I’m finished, as she is new to kettlebells, and I know she will enjoy it as a nice easy introduction to kettlebell training. I was in the middle of training for a Sprint Triathlon and a Marathon in 2011 when I became pregnant with my first child. My husband has been training with KBs for sometime and already bought me some “ladies” weight kbs. I purchased one or two Pregnancy workout vidoes before this one (non-KB) and they are boring to tears! Because I am 40, my doc has told me not to run (though I think he is being overly cautious) so I am very frustrated not being able to get a good solid workout in that will keep me strong without putting my little one into danger. THIS VIDEO is what I have been looking for. It’s sufficiently challenging, well paced, and a good use of time. The instructor is extremely pregnant herself and demonstrates everything, and includes a modification caption. The video gets your heart pumping, but keeps moving, allowing you to pause the video for how long you need to catch your breath. I really like that, so the pace of the video is solid. I definitely feel this the next day. If you’re brand new, get it, and work your way into it, and if you’ve been exercising before, I think you’ll be happy with this video, it’ll keep you working. I bought a Kettlebell last Summer and it came with a DVD that had three 15 minute workouts on it…I liked it ok but wanted something a bit more. Plus I was going to be trying for baby number two soon, so I wanted something to workout to while pregnant. I LOVE this workout DVD. I bought two other different workout pregnancy DVD’s also and all I can say is this one Baby Bells is the only one I will be working out to. This was the my main workout during my recent pregnancy. Most everything else I tried held no challenge. Other reviewers have summed it up well. If I had to say I anything negative about this, it would be that it seems rather low budget for the price. Didn’t LOVE the music. And Lauren, while in FANTASTIC shape, doesn’t seem thrilled to be there. I can’t remember if she smiles even once! None of these were a deal breaker for me. Lauren’s credentials are excellent. This workout is also an excellent intro to kettlebells. kettlebell workouts are wonderful prenatal workouts if you have prior kettlebell experience. when it’s tough to motivate yourself to workout, being able to pop in this dvd is great! my midwives say i have abs of steel, and i know that utilizing this dvd has helped me reatain a decent level of conditioning. This is an awesome workout. I love the fact that she is working with heavier weights during her 6th month of pregnancy. My husband has been driving me nuts with all of his worry about me lifing anything or continuing my workouts, I’m about to hit six months in a week, so it was nice to be able to point out that if the instructor can do it so can I. I’m a firm believer in not sitting around and getting fat and out of shape and want to maintain an active lifestyle during my pregnancy. This DVD will help me to that. As a disclaimer, I’m not pregnant, but I’ll sure save this DVD for down the road. I wanted to get into kettlebells, but I was concerned about my joints. I’ve had bursitis in my hips and knees, so I looked for a DVD that was low-impact. What I really like about this workout is that there are alternate forms for many of the exercises, which provides me with a way to complete the exercise without straining anything. There are some exercises here I just can’t do, even with the alternate forms: the lunges and squats just aren’t going to happen, so I’ll walk in place until she moves on to the next exercise. I was very pleased with the variety of the exercises, and I thought the instructor was excellent. Even as a complete kettlebell beginner, I felt confident with her instruction. I just wish I could find more of her DVDs on Amazon! This is my second pregnancy and I have used Kettlebells before. This is a wonderful and challenging workout for any pregnant person who is familiar with either Kettlebells, crossfit, or body building prior to pregnancy. Proper form during the exercises may be difficult to achieve or understand for those who are new to working out or strength training. Those who are not confidant because they are new to pregnancy or working out may have concerns about trying different exercises, but don’t worry it is all safe plus there is a modified version of each exercise shown in the video. Also, I would suggest coupling the video with additional stretching or a prenatal Yoga video. This is a challenging and effective yet safe workout. I am loving it, I will be using it as a postnatal shape up as well. If you like this video or are looking for a video like this but think kettlebells are no right for you might also want check out The Perfect Pregnancy Workout vol. 1. First, let me say I am a newbie to kettlebell work and far from an expert on this subject. This DVD appears to have been designed for pregnant women who wish to keep training, but is probably not meant for a pregnant woman looking to start a new exercise regime. I am not pregnant, but I am not in fantastic athletic shape either, so I purchased this hoping it would challenge me, but not be so killer that I would give up in frustration. This routine is less intense than Lauren’s first DVD, or Sarah Lurie’s Iron Core I, which are my only other kettlebell DVDs. However, I am not saying that this work out is easy – Lauren is about 6 1/2 months pregnant and still puts me to shame. The DVD is chaptered and includes a joint mobility/warm-up, three workout sections and a cool-down stretch; if you do all of them together, it clocks in around 40 minutes. It is just Lauren, no background exercisers, and she takes you through two sets of various kettlebell and body weight moves in each of the three sections. For many moves, she shows modifications via picture in picture in the corner. She alternates between three different weight kettlebells depending on what move she is doing (but never uses more than one kettlebell at a time). I only own an 18# bell, so I just use that, except I use an 8# dumbbell to do halos for now. She does 2-handed swings, overhead swings, sumo squats, push-ups, lunges, triceps extensions and a lot of other moves I can’t remember off the top of my head. If you need form pointers to learn the moves, you should check out Lauren’s other DVD (or, ideally, meet personally with an RKC trainer). The music is soft & relaxing; Lauren’s demeanor is calm & serious; the production values are very good. I am really enjoying this DVD. There is no dread factor for me and the slower pace allows me to focus on my form, rather than feeling I have to race to keep up and then getting discouraged. I am very happy with my purchase! I am new to kettlebells and to pregnancy (it’s my first time!). I got this DVD on the recommendation of my favorite women’s fitness blog and I am very happy with my purchase. I believe that pregnancy is not a time to wimp out on working out. Although there are some obvious physical limitations, it’s healthy for you and your baby to stay fit throughout your pregnancy. We quit the gym to save money and I needed something to kickstart me back into working out at home. I wanted a workout that was somewhat challenging. I also wanted something that was fun to do. The Baby Bells workout is fast paced and the instructor (Lauren Brooks) moves you through the workout in a serious and straightforward manner. It’s so great to see her beautiful baby belly too. If you are into kettlebell training or simply want to try something new and stay fit throughout your pregnancy, I would highly recommend this DVD. This DVD is probably great for beginners and intermediates. Although, she uses kettlebells, she also instructs that each weight lifting movement can also be done with regular dumbbells. Each movement also has an unweighted option if you’re uncomfortable with weights. I like this DVD a lot. I think the workout works for before, during and after pregnancy so the price is a solid value. The workout is broken into 3 segments which I liked as an “express” option if pressed for time or just tired. If you went into your pregnancy fit and are looking for a safe but challenging option to keep using kettle bells or weights you will be happy with this DVD. I was pleasantly surprised to see that my heart rate was in a moderate range the entire time. Here is one thing you should be aware of in this DVD. Lauren seems to assume some experience with kettle bells so the moves aren’t broken down extensively. This is good for run time but potentially problematic if you haven’t used kettle bells before. Although this DVD is designed for pregnancy you should remember that you can injure yourself doing kettle bells the wrong way pregnant or not. 3. The first few times you do the new moves have someone else watch you to see if what you are doing looks like how Lauren is doing it. Eventually you will be able to “feel” when you do it right but in the beginning having someone else there to tell you if you are off is important. A very good video to suit those who enjoy kettlebells and wish to continue workouts during pregnancy. I would love it if she chatted a little more, as I’m very used to fitness videos with chatting, interactive instructors, but that’s a personal preference only and I know that not everybody appreciates it. She explains the moves well, and it is a simple but effective routine. She demonstrates the routine while pregnant, which also gives a great sense of how the movements interact with a larger belly. I did a lot of heavy lifting before getting pregnant and dabbled with kettlebells here and there. If you’re not a fitness newbie, this workout isn’t particularly difficult, but it’s feels really good and usually leaves me feeling a burn in my hips/thighs and shoulders/upper back the next day. When I first did the DVD around 20 weeks pregnant, I thought it was pretty easy but still enjoyed it. Now at 30 weeks it is much more of a challenge and I’m glad I kept up with it. Lauren is no-nonsense and easy to follow. Highly recommend. Unlike other prenatal workout which seem to accommodate mostly sedentary women, this is a fun short yet challenging workout. I am currently 6 months pregnant and I usually do this workout twice a week after a 3 mile run or a 20 min modified HIIT workout. Even if you don’t work out that much you can easily do this workout with dumbbells or smaller kettle bells or no kettle bells at all depending on your overall fitness. – this whole workout is tailored around the muscle groups that are so important during pregnancy and afterwards. Pelvic floor strengthening, Sumo squats, modified push-ups, hip flexor stretch, squats in the birthing position etc. I also started doing Karyne Steben’s Perfect Pregnancy Workout once to twice a week and I highly recommend this as well especially in the second and third trimester. Good exercises and great modifications. I would have appreciated more instruction on correct form, as I’m a fitness professional and picky about that, but for more advanced exercisers it should be no problem. I enjoyed that she is so pregnant doing the exercises, but I wish she had a full shirt on. My husband walked by when I was doing the video and said “why doesn’t she have a shirt on?” Overall I’m really glad I got this DVD. It did come scratched though (bought used in “excellent condition”), so I just have to rewind to do two sets of the second set of exercises, or just remember what we did and repeat them. Not too big of a deal though. If you are like me and work in an office 10+ hours a day SITTING all day and haven’t workout out in years, this video is for you whether you are pregnant or not. I tried Lauren’s Ultimate Body Sculpt and Conditioning with Kettlebells DVD and it was wayyyyy to hard for me (non pregnant). I could barely do it with either no kettlebell or a baby 10lb bell. Then my recovery was so long after I gave up. If I would have tried this one I could have kept up with it. And it’s fun to watch Lauren’s belly! Now that I am pregnant I tried this and I could actually do it with a 10lb bell (or no bell) and am in the 1 week recovery range. I want to keep doing it once a week until I recover faster and can work up to more. I like that is is safe for all trimesters so you can use it the entire pregnancy. Lauren is good in letting you rest to get your heart rate down, and at 38 minutes you can still do it with your preggo exhaustion. She says you can do it with a dumbbell as well. And it actually has enough of a warm up and cool down that you don’t have to do more before/after like most videos that only have like a 30 sec cool down. Only negative: this video offers NO instruction. You need to know how to do the kettlebell swing, overhead swing, clean & press. I learned how to do these from Lauren’s instruction in her other DVD. Or look on Youtube. Otherwise everything is very simple. BONUS: if you buy from Lauren’s website she has a pregnancy e-book with TONNNNNS of preggo kettlebell workouts if you are more experienced! This is a tough but doable workout. I’m not currently pregnant, but wanted to get into better shape before pregnancy and be able to continue once pregnant. I’m a newbie to kettle bells, but absolutely love it! They take up very little space and are a great workout while kiddos are sleeping and you can’t spend hours at the gym. My husband (in good shape) has done the workout with much heavier bells than me and agrees that this is a tough workout. Not for someone who is pregnant and never worked out before. Definitely recommend! A great video for pregnant women in all trimesters, but also just a challenging workout by itself. There are plenty of modifications I can make to keep doing the video beyond my pregnancy, and to keep it challenging. I’m a runner who incorporates kettlebells for the great strength and cardio they provide. At 4 1/2 months pregnant I can’t run as much as I used to though and was afraid to use some of my other kettlebell videos as they do moves not safe during your 2nd and 3rd trimester. This one however is amazing!! I even got my husband to do it with me once and he was sore the next day. It’s long enough to give you a full body workout too if you don’t want to do anything else with it. I am not pregnant but felt this DVD still provided a great workout, got my heart rate up. I have Lauren’s first DVD Ultimate Sculpt and Condition Volume 1 and was ready to try something new but I was not ready for Volume 2 so I decided to give this DVD a try and I am so glad I did. I plan on alternating between baby bells and volume 1. I love the way I feel when I workout with kettlebells and Lauren is a great instructor. Before purchasing this DVD I was a huge kettlebell fanatic, doing more high intensity sets. When I found out I was pregnant I was so disappointed from a fitness perspective as I didn’t know how I should/could modify my workouts and my doctor suggested keeping my heart rate around roughly 165-170. I had stopped running maybe a month or so before getting pregnant so I knew I couldn’t just jump back into that. Finding this DVD made me absolutely ecstatic. Lauren makes sure to show proper form at angles in which you’re able to ensure that you’re doing the workout correctly, which is super important with kettlebells in general, even more so with pregnancy. The workout is sure to get your heart rate up, but not too high. It will also give you the opportunity to begin strength training, or improve what you’ve got due to the pace of the workout. My husband even joins me in this work out when he’s working to increase weights! I will agree that the production is not as high quality as other DVDs compared to the price, but I enjoy this too much for that to be a factor. I also wouldn’t necessarily recommend this to someone who has never worked with a kettlebell before as she does not verbally review basic form (aside from what you see) which may not benefit some new to this type of workout. This is more of a using the kettlebell as weights instead of a kettlebell work out. If that makes sense.I use the Art of Strength dvd when I want a good kettlebell workout. However, I think when you’re pregnant it might be better to use an easier dvd. I can understand that throwing around a heavy cast iron bell while pregnant isn’t so safe. She has you do a lot of stationary bell lifting. For example doing a squat while holding the bell. You can use a regular weight just as well with this dvd. It’s a good way to stay in shape, but don’t expect to use a kettlebell to it’s full capacity in this dvd. She only does a couple of trademark kettlebell moves. I think this is safe when you’re pregnant.